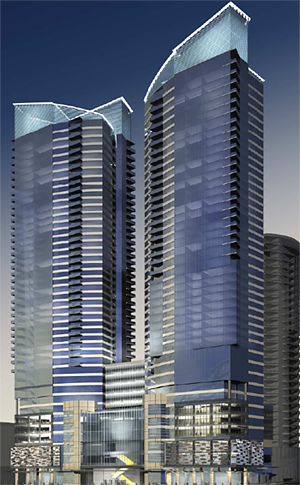 The Seattle Times reported that the proposed mega twin-tower project, Heron and Pagoda Towers, at 5th Avenue and Stewart is in trouble with the possibility the property will be foreclosed. About half the site of the proposed Heron and Pagoda towers will be sold to the highest bidder in June unless the developer pays off a past-due loan on the property, according to a notice filed with King County. New York developer Multi Capital Group filed permit applications for two 550-foot towers with 1.2 million square feet of condos, retail, hotel and office space. But the project was postponed indefinitely last year, one of many victims of the faltering economy and credit crunch. Now G4 Capital Partners, a New York lender, says a Multi Capital affiliate has defaulted on $13.7 million it borrowed in 2007 to help buy three of the five parcels that make up the project site. Unless the debt is paid, those properties, which total about 0.37 acre, will be sold at auction in Bellevue on June 19, according to a public notice filed on G4’s behalf last month.